Comment: 2 Discs in Near Mint / Mint Condition. Case Bright & Fully Intact. Speedy Delivery by 1st Class UK Post. Sold by Replay-International and sent from Amazon Fulfillment. 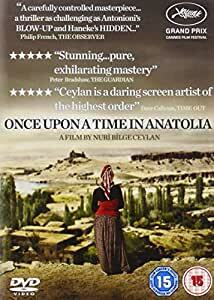 An epic and rigorous tale of a night and day in a murder investigation, Once Upon a Time in Anatolia is a beautifully photographed crime drama about police and prosecutors locating a buried body through one long night in the Anatolian steppes. In the short prologue three men are drinking and talking. Then a convoy of cars is travelling around the countryside at night as one of the men seen earlier is trying to remember where a body was buried. After several false leads and a rest in a remote village, the body is finally discovered early the next morning. In the course of the long investigation the characters and hidden thoughts of the main protagonists are gradually themselves exhumed. Be forewarned that this film attempts to tell a story in an authentic, almost real-time approach, which necessarily removes the sense of drama and excitement that many people expect in a movie. Personally, however, I found Ceylan's approach captivating. The result is more like epic literature than film. I think this has to do with the harmony between script, actors and photography. If we are going to be confronted with long takes of pensive, brooding faces, those faces had better be interesting and the photography had better be good. They are. The cinematography captures every nuance of the superbly reserved acting. For despite all the dialog (it is Ceylan's most "talkative" film to date), the spiritual depth captured by the camera remains mostly unspoken. Another reviewer called the film "atmospheric". I think that term sums it up well. This is emphatically not a "murder mystery" as a review quoted on the back cover claims. It is odd that New Wave Films have used such a misleading quote (which was probably taken out of context). People who watch it based on such a quote will be disappointed twice: not only is it not a murder mystery in the classic sense, i.e. a thriller that builds tension until the crime is solved, it is not really even a murder mystery at all because the film's central focus is a social-psychological portrait of a group of men, and not the crime itself which merely functions as a sort of loose framework. There are too many beautiful scenes to recount them all, but one of the most memorable takes place at the village mayor's home when the investigators show up ín the middle of the night and are treated to his warm hospitality. This scene brilliantly illustrates the local effects of the breakdown of traditional village societies in the wake of increasing urbanisation. What would you suppose is the connection between emigration and morgues?? The black humor inherent in the answer is exquisite -- and thoroughly believable. In sum, watch this if you love beautiful photography and phychological depth, but not if you are expecting some sort of thriller. The extras include a making-of and an interview with Ceylan at Cannes. The obtrusive interviewer has a tendency to interrupt or change the subject just at the point when things are getting really interesting, but nevertheless the interview provides interesting insights into Ceylan's creative process. The same goes for the making-of documentary, in which Ceylan's directing style is laid bare. Highly engrossing. 3.0 out of 5 starsWhat happened to the subtitles? Having seen 'Winter Sleep' with a friend at the Salisbury Arts Festival we were looking forward to watching this one. It is slow, not much happens, but the visuals are wonderful. The scenes of the three cars driving across the Anatolian countryside at night will stay with me for a long time. But what happened to the subtitles? Much of the time nothing appears while characters are speaking, and when the subtitles appear they are often unfinished sentences. Or there are answers to unseen questions. At first I thought it was something to do with my friend's TV so I watched another copy on my TV and the result was the same. Reading reviews I haven't seen anyone else complaining, so were we doing something wrong? 5.0 out of 5 starsI loved every sloth like second of this Turkish delight . . . Yes, this is as someone outlined on IMDB “2 ½ hours of grass and cars driving slowly” but contained within those 2 ½ hours is some of the most beautiful dialogue, cinematography and realism in acting that I think I’ve ever seen on screen. The comic nuances and timing were masterful. So much so that police officer simply asking for headlamps to be pointed into a field had me cackling with laughter. The film looked like a Rembrandt come alive. This is a charming and achingly beautiful film. First of all, this movie is a serious one talking about life, philosophy and sin. If you think already that it will be difficult, don't be. It's easy and simple enough for everyone. The scenary is breathtalking, shot sizes are just stunning it was a work of art. The movie is kind of long but I never thought it was boring at all. You will love it and watch it again if you manage to finish. Directed by Nuri Ceylan, this film won the Grand Prix prize at Cannes in 2011 and it is a meticulous and methodical picture. Clocking in at 150 mins, the story centers around a murder investigation. We are not shown the crime and the misdeed. The police already have the culprits in tow and just need to locate where the body was buried. We are quickly despatched into the dead of night, and the start of the search. A doctor, a handcuffed criminal and several police officers are all present and for the purposes of this film, together, they represent a trinity of the good, the bad, and the (imperfect but well intended) everyman. The search would appear to be futile at first, as the landscape is indistinguishable from one vista to the next. Especially in the pitch black dark. Soon, you sense that the characters, marred by frustration, become engulfed by their surroundings. Allusions are thrown up to metaphysical issues, not only in the cinematography, but by the nature of their conversations. An anecdote shared by the Prosecutor with the Doctor sets up a recurring conversation between the two. It would appear to be used as a device to discuss the incongruent relationship between science, with its reason and rationale, and spirituality, with its romance and mystery. No doubt about it, this is a film that takes its time, unravelling slowly. There are many conversations exchanged that, on the surface, appear inconsequential. Early on, there is a protracted discussion in the police vehicle about types of yoghurt. The lengthy dispute does nothing to further the plot. It doesn't matter. What it does manage is to make the viewer feel like the characters are human and tangible. These opinions reflect real people and they engage with sincerity, just as people do in every day situations. There are strong performances all round from the cast, who manage to reflect the complex make-up of the protagonists. The writers, Ebru Ceylan, Nuri Ceylan and Ercan Kesal, have succeeded in creating three dimensional characters who feel real, and come to the screen with a history. Thankfully, the cast's depictions are measured, understated yet emotionally effective. The photography, by Gökhan Tiryaki, is perfectly balanced too, capturing the natural beauty of the landscape without shying away from the gritty reality of the poverty burdened by many in the local community. This is not a film for everyone. If a blockbuster represents your average 3 minute pop song, then this plays like a mellow symphony. The story moves along with a whisper, rather than a scream. It is a film that has been lovingly crafted with an assured confidence; Ceylan understands the necessity to `show, not tell'. Shakespeare stated that life is full of sound and fury that ultimately, in the end, signifies nothing. Is the sound, the fury, those little conversations we have (like the characters do about yoghurt)? Are those, in reality, the moments that signify nothing? Is there really any more to life than the consequences of human politic? Of course, all of this is open to interpretation and discussion. Watch this film either alone, or with the right company, and in the right frame of mind, and there is a high chance you will similarly ponder. After all, these are undoubtedly the big issues and this film wants you to consider them. This is a great film that I feel will not get the exposure it deserves. To say more would involve plot spoilers. If you like serious films get this.